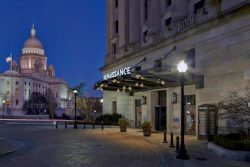 NEAGC reserved a block of rooms at the Renaissance Providence Downtown at a discounted rate of $149 plus tax per night. That room block is now FULL and no longer available. Attendees may still make a reservation at the hotel, although a limited number of rooms remain available. 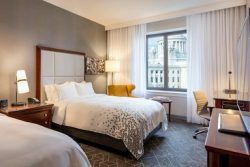 An additional room block has been made at the Hilton Providence (1 mile from NEAGC) for a rate of $139 plus tax per night. Please click here to take advantage of this group rate. A room block is in place for $139 plus tax per night. The Hilton is 1 mile from the Renaissance, site of NEAGC. The Renaissance Providence is approximately 11 miles from T.F. Green Airport, 52 miles from Boston’s Logan International Airport. The Renaissance Providence is one block from Providence Station, an Amtrak station. Northeast Annual Giving Association, Ltd.